Mark Hazel’s Gunroom: Established in Wotton-under-Edge in 1988, Mark Hazel’s Gunroom was founded after the factory Mark Hazel worked at in Yate closed down. 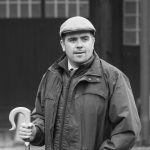 Not wanting to leave the area, and with a lifetime passion for the countryside and all forms of shooting under his belt, he decided to set up his own business. The Wotton Chamber of Trade’s president Duncan Elliott recognises this milestone achievement in the town. He said: “Mark has always been a stalwart supporter of the chamber.